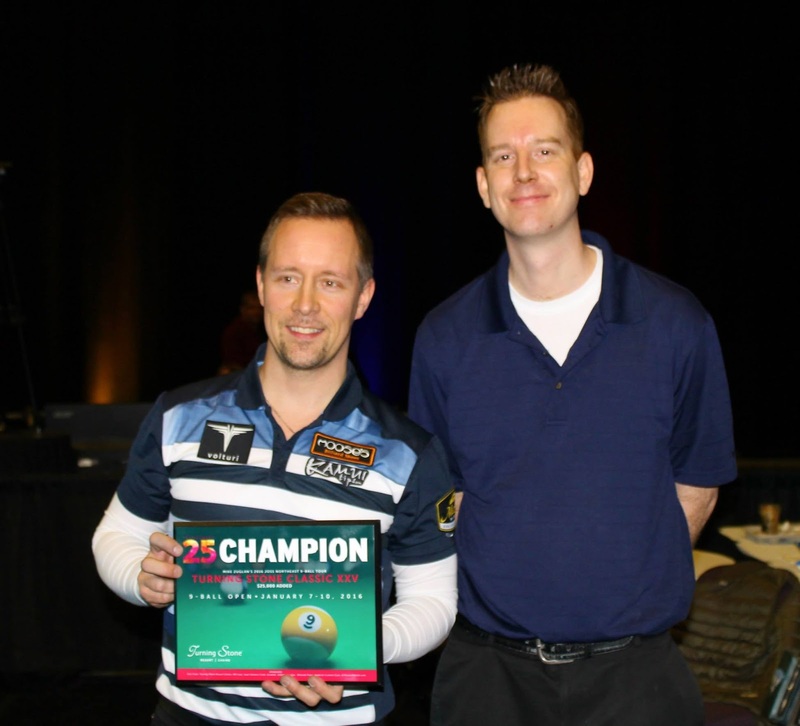 Turning Stone Champion Mika Immonen with runner up Erik Hjorleifson January 2016. Hello everyone I have been on a bit of a hiatus from my instructional column. I can assure you that my instructional mind has not been on break and I hope to bring you some great new content in the next few months. Today I would like to talk about a new skill which mainly applies to professional events, but for amateurs at the very least I hope they will be able to take away some viewing knowledge from this article. Up until recently playing 9 ball with the 9 ball racked on the spot was something that was only seen in Matchroom Sport events. As of 2016 the U.S. open and the World 9 ball Championships have also chosen to adopt this rule change. The spirit of the rule is to stop the corner ball in the rack (wing ball) from going straight in the pocket. Logically it would make sense because the rack is much higher so you would assume the corner ball would tend to hit the side rail rather than going in the corner pocket. Before I go forward lets remind ourselves that the goal of breaking in any pool game is to hit the rack in a way the same balls in the rack are consistently being pocketed. What has been seen since the implementation of this rule is that it is still possible to make the corner ball in the rack but you must cut the break. In other words send the cue ball to the side rail in order to make the corner ball. Here's where it differs from having the 1 ball on the spot, assuming using a magic rack or the balls are racked perfectly you can almost hit the rack in any way and the wing ball will still go in. Conversely with the 9 on the spot the contact point on the 1 ball becomes very specific, here are some things that are imperatively important to achieve consistent results when breaking with the 9 on the spot. #5 if you cut the rack to much or in other words the cue ball is going towards the corner pocket to much the balls on the same side of the rack that you are breaking from can jam in the corner pocket on the same side and negative results will occur. #6 this is all assuming using a magic rack or the balls are racked perfectly. Here is an example of a well executed break on the 9 on the spot. First break is at 3:12, watch the replays to see exactly how the cue ball moves in the seconds following. Looks easy but it is definitely not, very contact point specific. I will say it again if you hit this break square like you would with the 1 on the spot nothing like this will ever happen. As a side note, when Matchroom Sport first started racking with the 9 on the spot they implemented the "three balls past the head-string" rule. In the past few years they have gone back to 9 on the spot without the 3 balls rule because they found that players were having a hard time achieving the a legal break. To the best of my knowledge the W.P.A (World Pool Association) will be using the 3 balls past the head-string rule at the world championships this year, the difference is they will be using magic racks where as Matchroom racks the balls by hand. Overall breaking with the 9 on the spot is relatively uncharted territory. However for your interest if you have a chance to try the things I have talked about, you will be able to get a feel for what the pro players will be trying to achieve at this years world championships. One final note, I have not seen a player be able to consistently control the one ball off this break which I think is a good thing for the game. Greetings everyone hope you have had a great summer! We will all take the last the last breaths of warm air and as always pool season will once again kickoff within the next few weeks. This past week I was at the Turning Stone tournament in Verona New York and I must say the overall strength of the field was higher than I have seen it in quite some time. This year I watched more matches than usual and my attention as it usually does when I am watching pros, focused on the backstroke facet of their fundamentals. I have written about this before and I would like to visit the topic again adding a little more insight into what I believe is one of the most important aspects of proper fundamentals. The main thing that is different in the characteristics of the backstroke of professional players is the length of their backstroke. Some pros have longer backstrokes and some are shorter. Players that use a longer backstroke tend to have the slowest pace in their backstroke and tend to look the smoothest when playing. Players that use an average length backstroke tend to have an average pace backstroke. In my opinion these are the most consistent players. Players that use a short backstroke tend to have the fastest pace backstroke. Skill in kicking in my opinion does not have any direct correlation to stroke length. These are all generalizations of course but over the years these are the tendencies that I have noticed. To say that Shane Van Boening is a weak potter is obviously false and to say that Dennis Orcollo has weak safety game is false, the observations are more geared towards amateur players. Pros have so much experience in the game that they find ways to make their styles work for them. The question lies what length and pace of backstroke is best for you. In my opinion take a look at the tendencies I have listed and figure out if any of the areas that I have listed are major problems for you and if changing your backstroke can help those areas. Generally the most naturally talented players are best suited to longer backstrokes. These players tend to have a very high gear, they also tend to need to spend the most time practicing. Personally the way that I want to naturally hit the ball is with a longer backstroke. If I could choose any style it would be a medium length stroke but I have found that I have a hard time following through the ball properly with a medium length stroke. That being said I have known for a long time that my biggest weakness is potting and I am convinced that it is related to the longer length of my backstroke. After watching this weekend I have decided to try and shorten my backstroke to cut down on missed pots. I've tried it a few times since and it seems to helping. Finally no matter what length your backstroke it is is important not to rush it and the shorter your backstroke is the faster it will tend to be. Something to think about............hope this helps, thanks Erik. Pushing Out Strategy From "Big Red"
Hello everyone as the season is winding down I hope you have all done well in your season ending tournaments. For those of you that will be competing at the B.C.A and A.P.A championships in Vegas in the next few weeks I am sure you are not quite ready to put your cues away just yet. Last weekend I played in a finale tournament in Newmarket, Ontario. I had a good finish and was happy with my result on the day. In the winners side final of this handicap tournament I found myself at hill hill and it was the opponents break in this alternate break format tournament. He broke made nothing and left me in a situation where I had to push, it took me about two minutes before I finally decided where to push. The fact is that a pushing situation is probably the most variable shot in 9 ball that can come up because there are really no restrictions to what you can do, here are some of the thought processes that I go through when pushing. Firstly try to be positive about the fact that you did not get a shot off the break, if you break and have to push be happy that at least you didn't come up dry and leave your opponent a shot. If it was your opponents break and they did not make a ball be positive about the fact that they did not make a ball and have a shot at the 1. Positive mental attitude is such a big part of consistent performance as I am sure we all know. It goes without saying that you cannot push to a spot where your opponent has the advantage. Because he will then just take the shot and probably put you in worse trouble when you return. On the flip side it is very important to stay within that 40-45% range because if you go lower than that your chances of leaving your opponent in trouble when he gives the push back are not great enough. When you see two pros playing I would make a rough estimate that 75% or more of pushes will be given back. It's not that they don't see the shot that will be coming next its that they don't think chances of executing that shot are ore than 50%. Some examples of common pushes against pros are pushing to a jump or pushing to a kick safe. Although when pushing against an amateur I would tend to stay away from these types of pushes because the execution factor and knowledge of safeties with amateurs will be much lower. Therefore generally you do not have to put yourself in such a tough spot. It is all a very complex calculation. Even if you know you should be pushing to a spot that is 40-45%, how do you really know if the shot you've left meets that criteria and especially for amateurs this can be very hard. What you have to try to do, is to the best of your ability push to a place that you think meets the criteria while taking your opponents skill into consideration at the same time. It is a great feeling to push to a spot where you know you'll have to execute a tough shot if you get it back and to come back to the table and do just that. Again this does not mean executing a very low percentage shot, that will never give you consistent results it means executing a shot in that 40-45% range. Hope this helps, we are very happy with the progress of the site and we thank everybody who has become a fan. I would like to thank my partner Markus for all the hard work he has been putting in, we are looking towards big things in the near future. 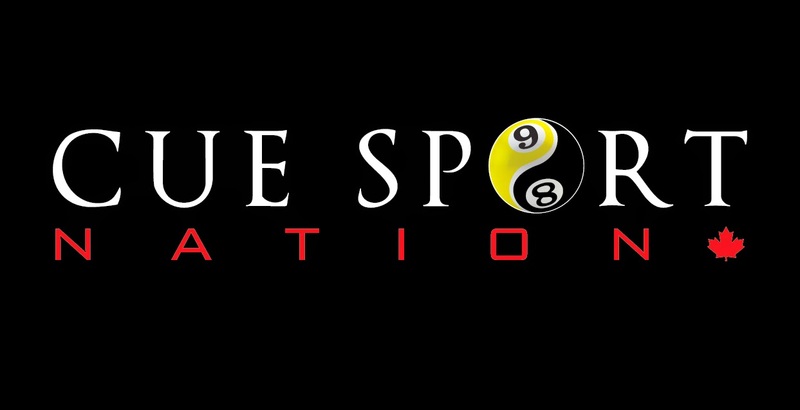 Good day everyone I hope all of your year end tournaments are treating you well and for those in play-off's competing for Las Vegas, Cue Sport Nation wishes you the best of luck. Every Tuesday I offer instructional help at a local league here in Toronto. Recently after a major rent increase by the landlords the room owners decided to look for a new location and we are completing the remainder of our season at a new room. The playing conditions in the new room are fairly adequate but the one thing they are missing are pro quality cue balls. The ones we are using are probably 20 years old, they are an undistinguishable brand and are smaller than the object balls. Even my intermediate level league players immediately noticed a difference in how the cue balls reacted. For this article I will try to convey what my knowledge is about using different types of cue balls. I would first like to state that the following is based on my opinion of the feel that I have received from different cue balls. It is very hard to find factual literature about what I am talking about, if anyone has opinions about anything stated, feel free to share them in the comments section. 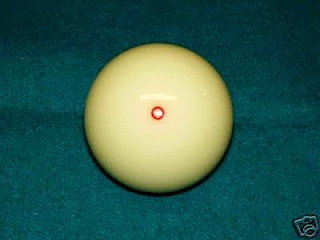 The two biggest factors that contribute to how a cue ball plays are the size and the weight. The heavier a cue ball is the harder it is to draw (this one is pretty obvious), more implicitly the heavier the cue ball is the less it will deflect towards the object ball. The weight of the cue ball is also relative to its size, generally if the cue ball is heavier or bigger than the object balls they will cut less than the natural angle. When we played bonus ball however the cue balls were bigger than the object balls and the object balls seems to cut more, this one still baffles me to this day. I think it had something to do with the overall make up of the material used in the bonus ball sets. That being said the cut angle is not as big of a factor as the amount that the cue ball will deflect towards the object ball, again the lighter the cue ball is the more it will deflect. Another factor that also is often overlooked is the colour of the cue balls, this one is very deceiving because you can have the same make of ball playing differently relative to its colour. Cue balls that are more yellowish in colour are usually newer and more dense, these cue balls draw and deflect less than cue balls that are lighter in colour. 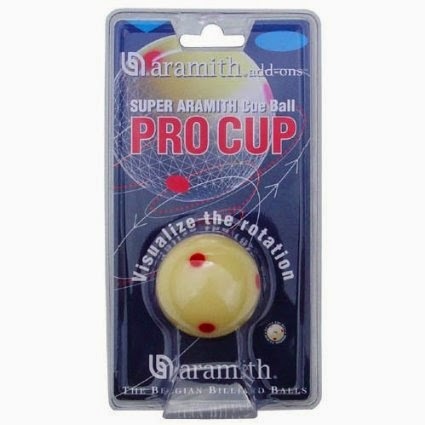 I have noticed that you tend to see difference in colour most often with Super Aramith Pro Cup cue balls. Out of the four that I am listing I believe this is the heaviest and also the largest in diameter. I believe that it plays the truest as to the proper reaction it should display. You will find these most commonly used on diamond bar tables or in rooms that have diamond tables. 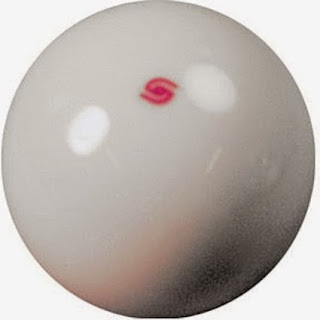 I find this cue ball to be a little lighter than the Super Aramith Pro Cup, it is also in my opinion closest in size to the size of the object balls. Of the cue balls listed this ball is the lightest, For a number of years it was the #1 ball on the market but has been overtaken by the measles ball, of the three listed it deflects the most an will draw the easiest. These are new on the market, they are made in china and it would be very rare to see them in a North American pool room. However they are used in all events that are promoted by Mark Griffin and CSI International including the Derby city Classic and the B.C.A.P.L championships in Las Vegas. I have limited experience with these cue balls but I would say that they play somewhere in between a measles ball and a red circle cue ball. 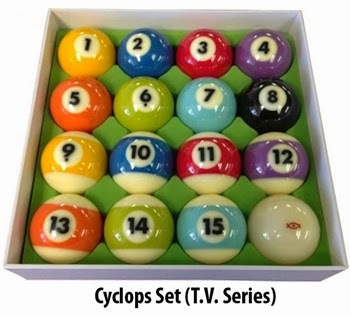 There are also many other types of balls that you will come across in your competitive travels, including different qualities of object balls, which will affect play as well. My best advice is to keep a mental note of how they all react and develop a feel for them that you can recall at any time. The fact is you cant be thinking about everything in this article when you're down on a ball, you have to make it all a part of your subconscious feel which is the most important thing in billiards. Good day Cue Sport Nation readers. I found this drill on Facebook a few weeks back and although I am not personally a huge fan of drills, I do think they can be beneficial especially when the shots that you have to execute in the drills are applicable to real game situations. I like this drill because most of the shots deal with balls that are very near a rail which is very common in the rotation games, particularly 9 ball. It also involves going up and down table on each shot which adds a nice level of difficulty in the drill. I don't know the player shooting in the video but he looks like a strong semi pro caliber player, and it is nice to see someone execute it with good quality. For your interest I am going to give some insight into how he executed the shots in the drill. -The 1 ball is fairly straight forward because he starts with ball in hand, I think there are two ways you could try to play position on the 2. You could take the wider track like he did or you could try to get straighter on the 2, I like the way he played the shot because this way you take out the variable of landing to straight on the 2. -The 2 to the 3 is a nice shot, usually this type of shot is played drawing the ball past the side pocket not before it but because of the angle of this particular shot he executes it correctly. Notice that instead of floating the cue ball one rail he uses 2 rails for better control. -the 2 to the 3 is pretty straight forward, using the rail to pay into the angle of the 4. -The 4 to the 5 is a classic straight back power draw, watch how he lengthens his backstroke and follow through on the shot to create more power. -On the 5 to the 6 I think I would have used a closed bridge, because the speed of the shot is pretty high. I would like to note as well that on shots like the 2 to the 3 and the 5 to the 6 he could also go 3 rails forward but the positioning of the balls in this drill dictate him to draw the ball two rails. -The 6 to the 7 is a little tricky because I believe he over hit the position on the previous shot, he wanted to play more to the middle of the table. Kind of odd that he over hit it by so much but if he wasn't trying to play it to the middle I would definitely recommend to do that. I cant tell if he had the angle to go forward from the 6 to the 7 but if he did that is the right shot, if he chooses to draw it like he did I would have tried to draw the cue ball all the way back to the side rail and back into the angle for the 7. - The 7 to the 8 is a simple one rail but notice the he chooses to play the natural angle instead of drawing the ball which some players might have done. He makes the right choice here, whenever you can move the cue ball naturally, or naturally with a tip of spin it is almost always the right choice. -the 9 to the 10 is one of the shots I'm not going to say what he did was wrong but personally I would draw the cue ball 4 rails to try and get underneath the 10 creating a more natural angle to get back on the 11. Notice that he ends up over hitting the shot from the 10 to the 11 which left him in his toughest spot in the run out. -From the 10 to the 11 I would've followed the cue ball 1 rail to try and get more angle on the 11. The max draw angle on that shot was always going to leave him with a straighter shot coming off the third rail. was a tough shot all around and he got a little lucky with the cue ball, almost scratching but all around a very nice out. I recommend that you watch the video 3 shots at a time to better follow the instructional analysis. Good luck hope this helps. Hello everybody I have been on a short hiatus from my instructional posts as we went through the busy season of the pool year. As the year winds down I will have more time and you can expect my bi weekly articles to be back on track. The first week of April we had our national championships at the Delta Hotel in Mississauga, Ontario. Among the many friends I saw there was Chris McKenzie, a professional golf instructor now living in Alberta. In one of our conversations, Chris shared with me an analogy pertaining to the mental game and I would like to share it with you today. The basis of the theory is to not put unrealistic expectations on ourselves. This is something that I think a lot of pool players do. I am not relating the expectations to the overall outcome because of course we all expect to win but more to the overall in game performance that may or may not lead to the winning outcome. The theory asks us to imagine a jar of about 20 black and white pills, if you like you can even imagine those pills as different shades of black and white. Now imagine that for each shot you take on the pool table you are randomly choosing a pill from that jar. The whitest pills represent a perfectly executed shot, then there are darker white pills that represent a shot executed at an average level. For example you pot the ball but your shape is not perfect. Secondly there are the black pills, they represent things like misses, positional errors and fouls. The goal of the theory is to raise awareness that EVERYBODY has some amount of black pills in their jar. For example on a tough long pot on the nine ball a world class pro might have 4 black pills out of 20, a semi pro might have 7, an amateur could have 10 or more. Even if you literally choked to the point where you just couldn't make the ball the theory asks you to not blame yourself. Rather to be realistic about the fact that at this point in your game you are either not comfortable enough in the situation, there are problems in your fundamentals that give you a lack in confidence or a number of other things that lead to you having a certain number of black pills in your jar. The more bad ones you have the more likely you are to pull one out, the key is to figure out why you have the black pills in the jar and work on the areas that will lower them. I think if you at least think about this periodically it can help you stay calm in a match, not getting to the point where your performance is compromised because you are flustered mentally. One of the worst things a player can do is to be in their chair with a scowl on their face because they feel embarrassed or upset about making a mistake. The theory asks you to rationalize that if you have 10 black pills out of 20 there was a fifty percent chance that you would not execute and there is no need to be upset or to carry a negative emotion along with you in the match. If you can just sit down and have a little laugh about it and say well I just pulled another black one gotta get rid of those, it will help you to stay positive. 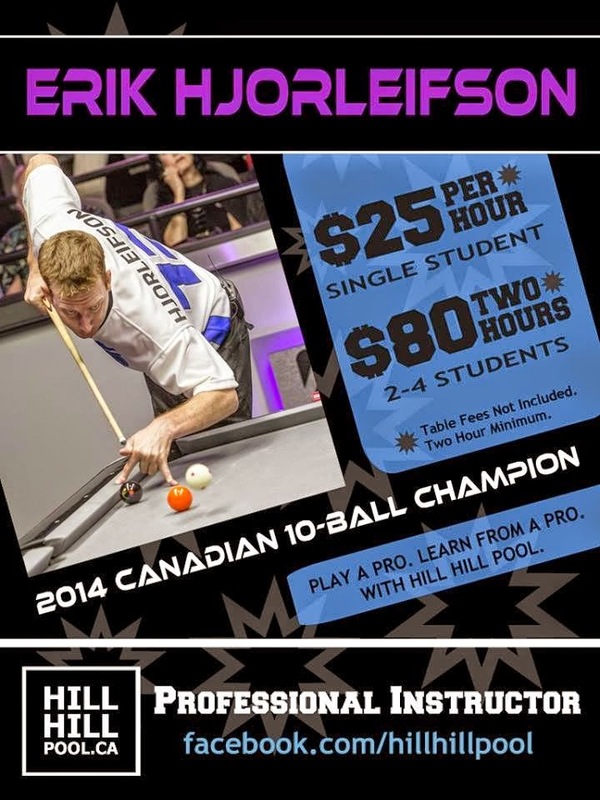 For me at the Canadian Championships this year most of my black pills were on the break and in long potting. The potting was skewed because there were only ceiling lights at the venue and no direct lighting over the table but I rationalized that the lighting gave me a larger number of blacks and tried my best to accept it. I finished second in the 8 ball and the 10 ball divisions and I think the #1 reason I did well is because I stayed calm, not all because of this theory of course but I did think about it quite a bit during the tournament. Good day everyone today I would like to bring something up that I experienced while playing a regional tournament in London a couple of weeks ago. This was an Open tournament with no handicaps and I came in as a pretty big favourite. Most of the best players in Ontario were there but there was only one player that I would consider at a pro/world class level. The draw was done in this 64 player field and I immediately found myself looking for where this other player was located in the draw. The first few rounds I played some good players but still felt like I was coming into the match as the favourite. As I stated earlier I saw that I would be playing the other favourite in the tournament in the final 4 on the winners side. It ended up being a long day as they decide to finish the tournament in one day, as it progressed and I was winning my matches I kept thinking intermittently about the big match-up in the final 4. In this match my overall mental makeup wasn't the same, although I have a winning record against this player I played at a much lower level in this match than I did during the other matches in the tournament. Turned out I was fortunate and won the match but I remember that in the next round which was further along in the tournament and even more important in a way, I went back to my normal mind frame coming in as the favourite. I played good and won fairly easy, this day reminded me of possibly the biggest mistakes you can make in pool and that is worrying about who you are playing or being intimidated by your opponent. I think this is very evident when amateurs or even semi pros are playing a pro level player, at this skill difference a player might think he has lost the match before it has even begun and this is a fatal error. Of course there are scenarios where a beginner level player is so far apart in skill level that reality is they will probably never win but any kind of skill difference such as pro to semi pro or strong amateur to weak amateur there is no reason to ever think like this. In any kind of handicap scenario the same should always hold true. I was recently watching a post match interview with Dominika Cibulkova (CZE) at the Australian Open tennis tournament and the interviewer mentioned that she would be facing Serena Williams in the next round, the first thing she responded was that she wasn't even aware of that and she never looks at the draw until she's advanced. Sounds a little extreme but you could tell by the way she said it that she really didn't know, personally I'm not sure if I could go as far as Cibulkova did but the lesson of the story is that she is only worrying about her own performance not her opponents. On the flip side sometimes you will hear players saying I took my opponent for granted or they were brought down to their level or that the speed their opponent was playing at threw them off. I generally find these to be a pretty poor excuses but I hear it often and comes back to the point I am trying make. Which is to try and stay within yourself as much as you can and worry about your own performance rather than anything related to what your opponent is doing. It is all easier said than done but I thought I would bring up the topic because I noticed that it is something that after 20 years of playing still crept in to weaken my mental game a few weeks ago. I can tell you that if its not something that you are willing to work on it can be one of the most detrimental things in pool.